Polypropylene mesh is widely used for the reconstruction of incisional hernias that cannot be closed primarily. Several techniques have been advocated to implant the mesh. The objective of this study was to evaluate, retrospectively, early and late results of three different techniques, onlay, inlay, and underlay. The records of 53 consecutive patients with a large midline incisional hernia — 25 women and 28 men, mean age 60.4 (range 28–94) — were reviewed. Polypropylene mesh was implanted using the onlay technique in 13 patients, inlay in 23 patients, and underlay in 17 patients. Either the greater omentum or a polyglactin mesh was interponated between the mesh and the viscera. The records of these 53 patients were reviewed with respect to: size and cause of the hernia, pre- and postoperative mortality and morbidity, with special attention to wound complications. Patients were invited to attend the outpatient clinic at least 12 months after implantation of the mesh for physical examination of the abdominal wall. Postoperative complications occurred in 14 (26.4%) patients. The onlay technique had significantly more complications, as compared to both other techniques. Reherniation occurred in 15 (28.3%) patients. The reherniation rate of the inlay technique was significantly higher than after the underlay technique (44% vs 12%, P=0.03) and tended to be higher than the onlay technique (44% vs 23%, P=0.22). 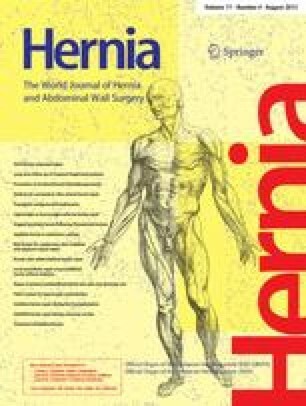 Repair of large midline incisional hernias with the use of a polypropylene mesh carries a high risk of complications and has a high reherniation rate. The underlay technique seems to be the better technique.